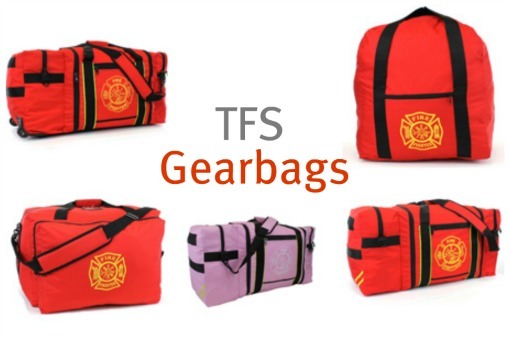 On Scene: New Product: TFS Gearbags! TheFireStore has launched a few new gearbags that are currently hanging out in the New Products section of our website. We have a great jumbo gearbag with wheels, and it's big enough and tough enough for all your gear! We also have the same great jumbo gearbag without wheels, too. We sell the large, deluxe, step-in gearbag which is meant for use from the very active firefighter. Our traditional jumbo gearbag also comes in a highly-demanded pink color! Of course, this could be for the ladies, or to support breast cancer awareness. Then we also have the standard step-in gearbag which is designed to fit your supplies and equipment on a bit smaller scale. Overall, you won't be disappointed with your choices in TheFireStore's own line of firefighter gear bags. Trust us! Check them all out on your own, here.